It’s official! 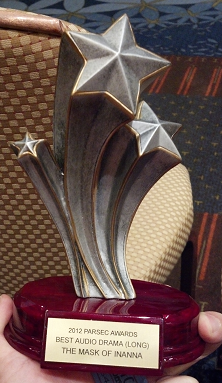 Announced at Dragon*Con… The Mask of Inanna has won the 2012 Parsec Award for the Best Speculative Fiction Audio Drama (Long Form) category (initial announcement). For those who don’t know, the Parsec Awards are one of the most prestigious audio drama awards out there. Julia Lunetta picked up the award for me (shown to the right). Thanks to everybody for the love and support we got. Here’s a link to my acceptance speech, which Julia read at the ceremony. Listen to audio of Julia Lunetta and Brad Smith getting the award and giving the speech here (2.5MB MP3) – original source. There should be video of the awarding available when we happy Inannaites return home, catch up on sleep, and get the cellphone video into a more easily accessible format.